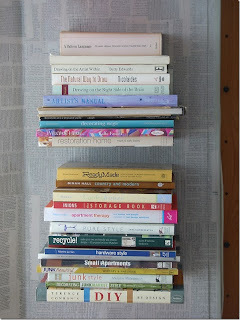 Since we had to do a Do It Yourself blog post and I love books I thought that this DIY project would be perfect for me. 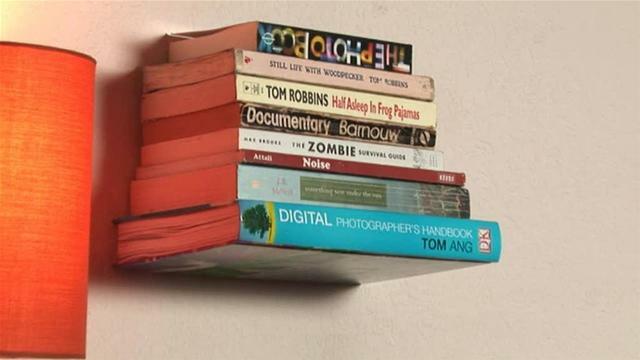 I found a video on this website called videojug.com and it had different videos showing you how to install different types of shelves but I thought that this one was the coolest because it looks like the books are floating. Step 1: Where's The Middle? Open the sacrificial book's back cover and use your tape measure to find the halfway point. Make a mark on the page, then trace the bracket from the mark out. 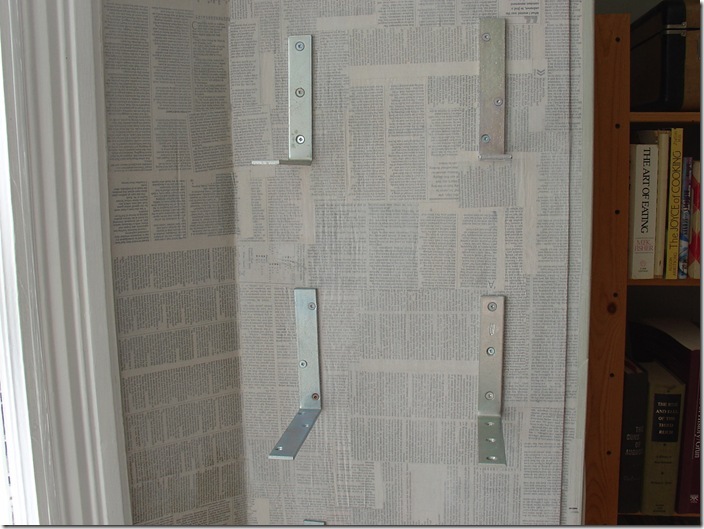 Use your utility knife to cut into the pages of the book, following the outline of the bracket. You can toss the excised text to the wind. Cut deep enough so the back cover of the book can be closed tight against the pages. Then use your knife to make a notch in the book edge for the "L" bracket. 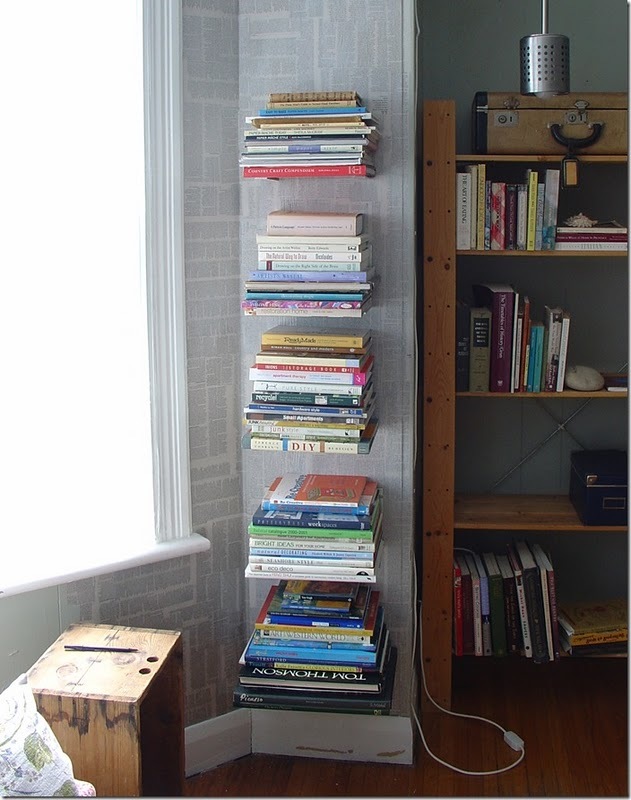 This way the book can sit flush against the wall. Get your drill out and drill through the holes in the "L" Bracket. Secure the "L" bracket in place by screwing together the pages of the book. The pages will rise up the screw as you insert it, so use your hand to hold the pages down. Then drill two holes near the outside corners of the book, one on each side, and secure the pages by inserting screws into the holes. Cover the inside back cover of the book in glue and close it. 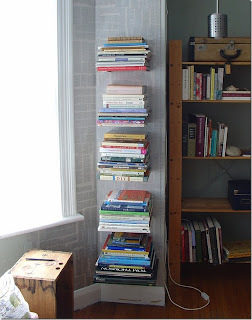 Place a stack of books or some other type of weight on top. Now let it dry - overnight. Cheating this step is not advisable. We know you're excited, but just wait. Really. It'll be worth it. Figure out where you want the books to go and find the stud. Do this by knocking on the wall until you hit a solid point. Another way to find a stud is to get a stud finder. Now mount the bracket to the wall using the large wood screws. 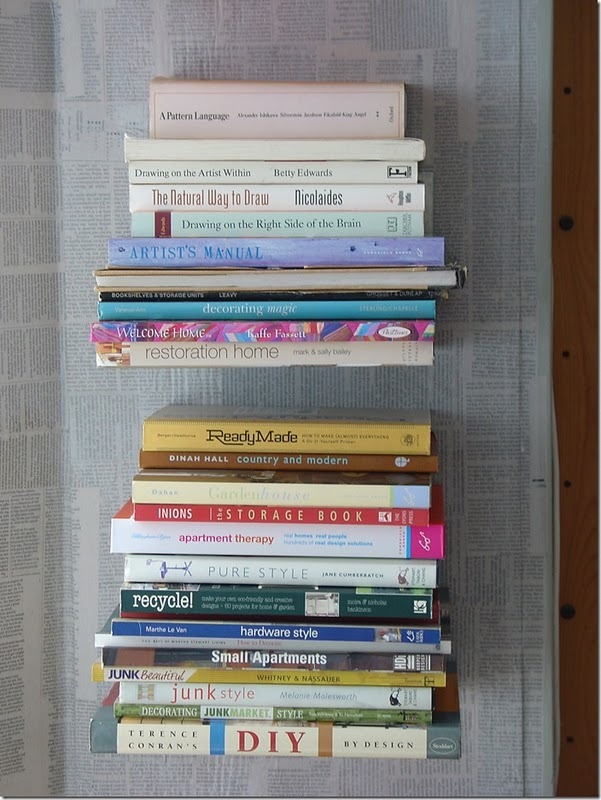 Find your favorite, most intellectually and artistically impressive books and stack them up high enough to cover the bracket. Largest to smallest. Now let your friends try to figure it out. 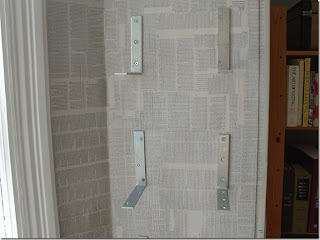 This DIY project was really fun and easy. I think that I enjoyed this project even more because I found a project that worked well with my interests and my personality instead of just looking for a project to do. The one thing I really didn't like about this project was that I had to destroy one of my books, so for the bottom book I looked for an old book that I didn't really enjoy or wish to read again. If you wish to try this DIY project the website is http://www.videojug.com/film/how-to-install-invisible-shelves. That is such a simple yet brilliant idea! Perfect for me as I have farrr too many books!